15 | March | 2015 | NOT IN MY WORLD!!!! MINERAL WELLS – Do purses from names like Vera Bradley, Brighton, Louis Vuitton, Coach, Tory Burch, or Michael Kors hold a special place in your heart? Perhaps you like the idea of playing a fun game of Bingo – with the purse as the purse. 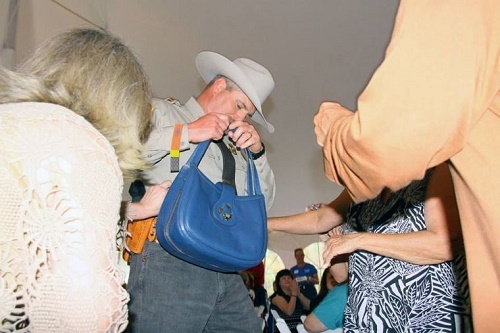 Add to this local law enforcement officers and fire fighters modeling these designer handbags. Perhaps this piques interest? The fun takes place 6-9 p.m. at Clark Gardens Botanical Park, with admittance beginning at 5 p.m. Tables that have been sponsored will be guaranteed reserved seating near the action. All other (general admission) seating will be open and based on a first-come, first-served basis. One ticket to “Bags, Bingo and Badges” includes 20 Bingo game cards for the ticket holder to play for the chance to win a designer handbag, retailing from a couple hundred dollars upwards. Additional game cards will be for sale at the event for those who want to increase their odds of winning a specific bag. There will be light hors d’oeuvres and beverages served. A cash bar will also be available. “This year, I’m told the catwalk will be longer. Another exciting addition is that we will have Deborah Ferguson from NBC Channel 5 News will be our emcee,” she added. “Bags, Bingo and Badges” coincides with April being “Child Abuse Awareness Month.” As a non-profit organization, affiliated with the Children’s Advocacy Centers of Texas, the new Children’s Alliance Center for Palo Pinto County and its staff bring together local law enforcement investigators, Children’s Protective Services’ investigators, prosecutors, victim’s advocates and medical and mental-health professionals. Each discipline is represented on the CACPPC’s multidisciplinary team. The team collaboratively staffs cases, conducts forensic interviews and works together to build a legal case against alleged perpetrators and helping victims and their non-offending family members through services and referrals to resources. Not yet a year old, the CACPPC has served more than 100 children through 72 child-abuse cases, all involving outcries alleging abuse, including sexual and physical abuse, domestic violence, neglect, death and arson. Tickets are $30 per person for advance tickets or $40 at the door (if available). Tables that have been sponsored will be guaranteed reserved seating. All other (general admission) seating will be open and based on a first come first serve basis. Tickets are available for purchase from Titan Bank, Palo Pinto General Hospital’s Gift Shop, Cole’s Flowers, the CACPPC (located at 204 SE 3rd Ave.) or through the website www.cacpalopinto.org. Event sponsor is First Financial Bank. Game sponsors are Titan Bank, Community National Bank, Jonell, Inc., Farm Bureau Insurance, Ace Hardware, Jack Powell Auto Group, Kim and Dan Kinerd, Barbara Upham and Bob Dempsey, Genesys Aerosystems, North Texas Pressure Vessels, Mineral Wells B&PT, Texas Drinking Water Systems, Inc and Blackbird Consulting. Game sponsors range from $1,000 to $5,000 and there are currently just five spots left. For sponsorship or event information, contact Joy Eaton at 817-991-9574. “Bags, Bingo and Badges” is not just for women; men have a chance to have fun and come home a hero by bringing their significant other a very nice bag.